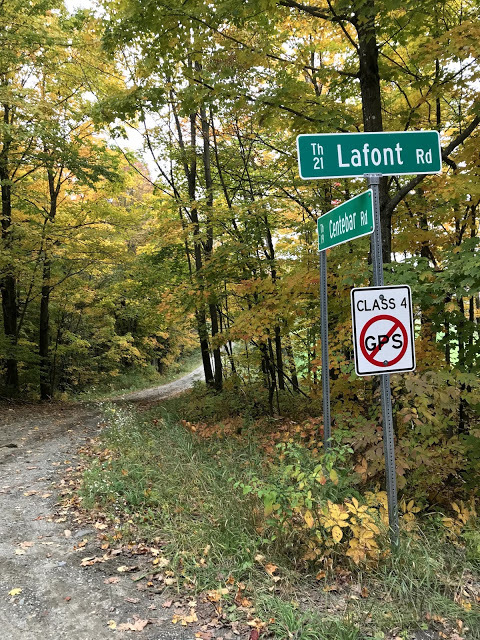 The Fall Classic is an end of season Vermont pairing of Populaire and Brevet length routes, featuring more difficult, mixed terrain riding on dirt, gravel and Class IV Vermont pave. 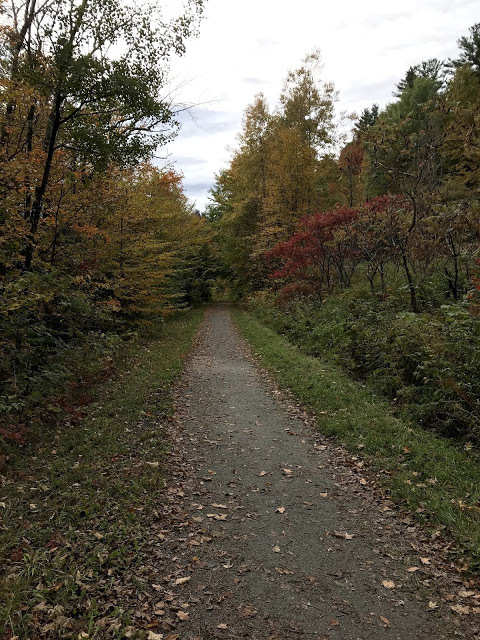 This year the routes explore Vermont’s Northeast Kingdom during changing season, high time foliage, and the region’s fall harvest. 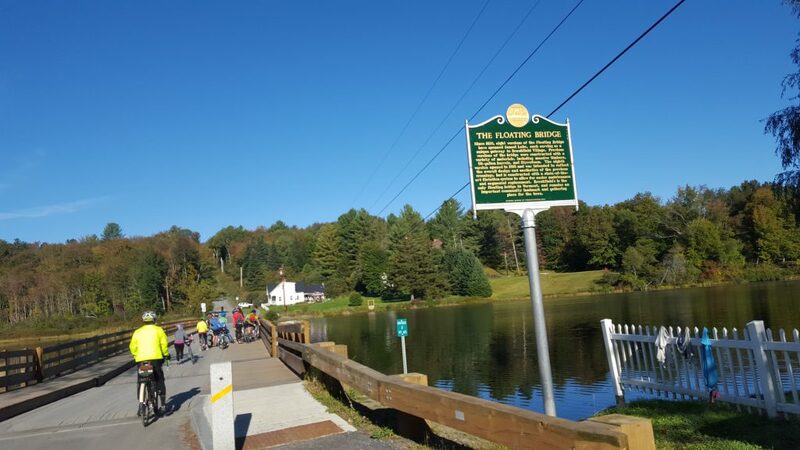 Both rides begin and end in the small town of Montgomery Center, VT in the heart of the northern Green Mountains. As in years past, the ride will be followed by a social gathering to celebrate the finish of the NER season. The Fall Classic NER rides have a storied history, beginning with a pair of routes designed by famed NERd Mike B. in 2010 out of the big city of the north. By 2012, the routes had attracted dirt-curious randonneurs from all along the Northeastern seaboard – ME, MA, VT. MA, NH, NY, and Washington DC. That years ride became a sort of celebrated resurgence of dirt road randonneuring in the NER canon. Fond “misty memories” propelled this route for another season or so until Anthony M. out of the big capitol designed a new dirt-centric pair of routes for several years. 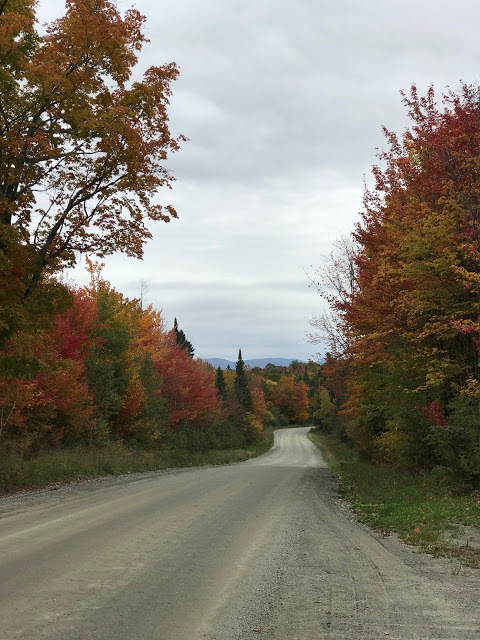 This year, with a new organizer, start, and routes, we hope to honor the tradition of the Fall Classic while bringing New Englanders to a new region of VT dirt. The 120k is 85% dirt with about 6000ft of climbing; the 207k is 95% dirt with nearly 11,000 ft of climbing. Both routes are challenging, punching high on both the climb:distance and dirt:paved ratios. Both routes feature minimally maintained Class IV dirt roads. The condition of these roads/trails largely depends on the weather leading up to and during the event, and the whims/budget of town road maintenance. Riders will encounter short sections of ruts, mud, boulders, soft sand, gravel, steep descents/ascents & downed tree branches. Conditions may change along these roads within a very short distance so be prepared for variable conditions. Wide tires will prove helpful, especially if the weather is inclement. I (Daniel) can’t heartily recommend anything less than a 42mm tire, though many ride 700c x 38mm with aplomb around here. 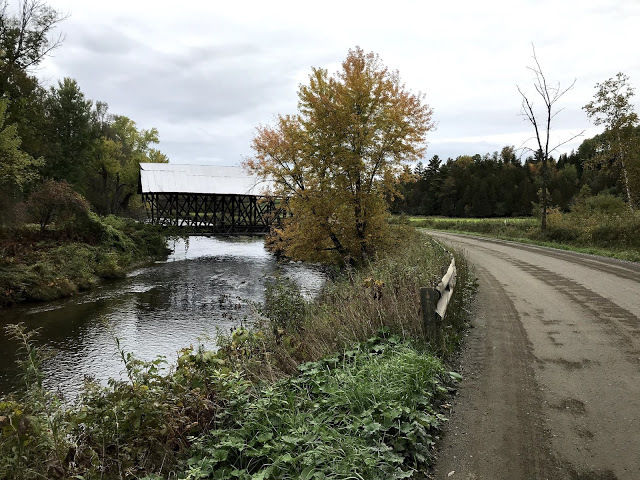 Bring a sense of adventure and a full toolkit – you’re likely to love these quiet, scenic stretches as they pass through remote areas of northern Vermont. 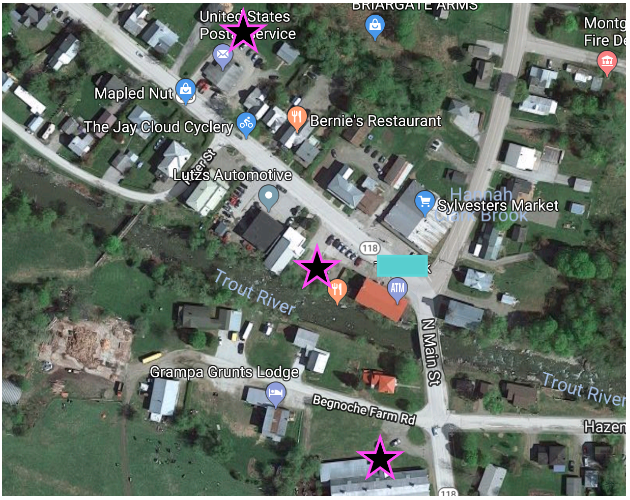 The start location of Jay Cloud Cyclery/Blue Bike Cafe will be open early to accomodate riders of the 207k. They’ll have baked goods for sale if you need additional food or coffee right at the start. A post ride celebration will be held from approximately 3-8PM at the finish location of Blue Bike Cafe in Montgomery Center. Food will be provided; drinks of all variety will be available for purchase from the cafe. Begnoche Farm at the SW intersection of Hazens Notch Rd (Rt 58) and Main St. (Rt 118). Behind the US Post Office/TD Bank Building on the north side of Main St. (Rt 118). Lot between Lutz Auto and The Snowshoe on the south side of Main St. (Rt 118). If you’ll be coming up to Montgomery Center on Friday, October 5, there are several great Inns, B&Bs, and Air BnB offerings in and around town. Additionally, plenty of tent space is available at the ride organizer’s home – all are welcome but let us know beforehand via email if you’d like to do so (daniel.seth.jackson@gmail.com). 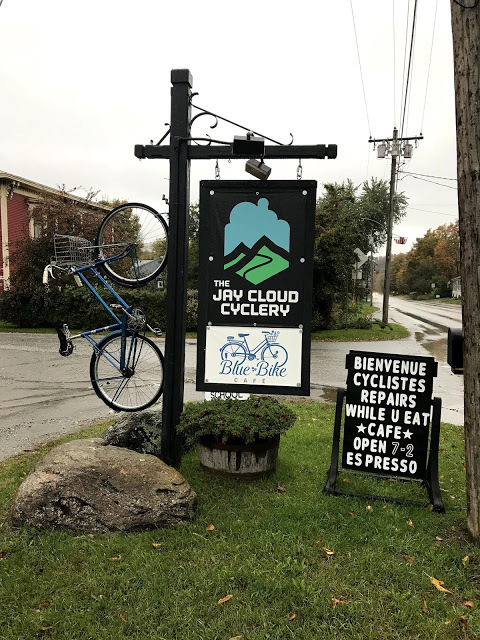 Both rides start and end at The Jay Cloud Cyclery/Blue Bike Cafe in Montgomery Center, VT – a favorite cafe-bike shop hybrid business on Main St. The rides have different start times but enjoy the same celebration beginning around 3PM. Riders are free to shower after the ride at the ride leaders home just up the hill out of town. The 207k heads south out of Montgomery Center on Rt 118 and quickly climbs 1000ft into the Deep Gibous of the Cold Hollow Mountains. Upon entering the Gibous, Class IV roads, covered bridges, and Highlander cattle predominate the crossing of the Cold Hollow range. Roads through the Gibous can be washed out as they dip in and out of river crossings. Be prepared to stop quickly to avoid ruts and baby heads. Once atop the narrow pass of Enosburg Mountain, the descent off is initially gnarly, eventually dumping riders into the first control at the Bakersfield General Store, mile 20. Ice cream or breakfast sandwiches await. Riding southeast out of Bakersfield, riders head back onto the shoulders of the Cold Hollows, up and over Waterville Mtn Rd. and into Waterville. Following the Lamoille River valley via relatively flat roads and Rail Trail, riders pass through Johnson and Hyde Park on their way to the second control at the Morrisville Food Coop in Morrisville, VT. Eat to your hearts content as you’re about to climb over Eden Mountain, but know that the best food on the route is to be had 23 miles hence at the Craftsbury General Store. Riding north out of Morrisville, riders climb up and over Cooper Hill via dirt roads paralleling Route 100 on their way to Eden. Just outside Eden, the route tracks east, beginning the climb over Eden Mountain Rd. towards Craftsbury. Just over 500 ft into the climb and just before mile 59 is the next control – an info control that requests you read and record the two words of graffiti across the rock outcrop on your left (northeast side of road). 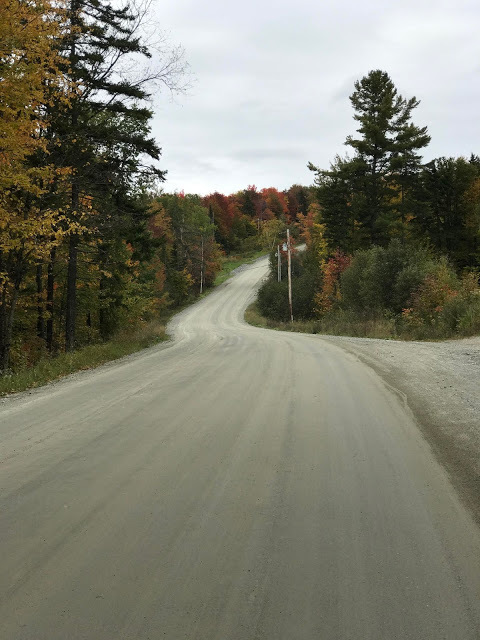 The dirt descent down into the Craftsbury Valley is usually well maintained, fun and swoopy. Head into Craftsbury Common, then south into Craftsbury to the next Control at the cyclist friendly Craftsbury General Store. Lunch here is fantastic – pizza, sandwiches, baked goods – the stuff of which rando dreams are made. 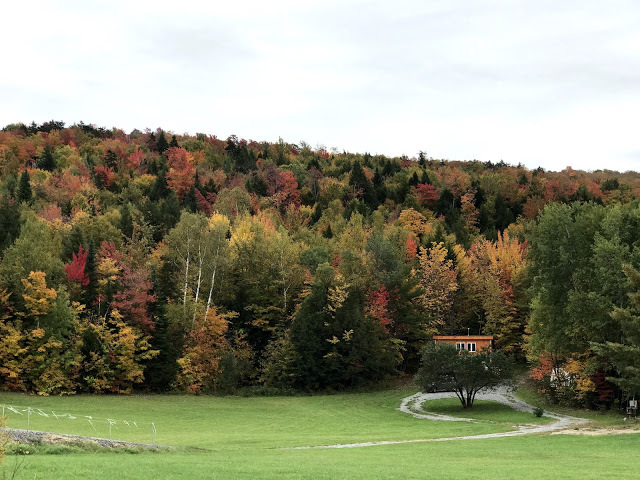 Out of Craftsbury, the route follows a ridge heading north into Irasburg, passing old farmlands, gnome homes, and forests with views of the Green Mountains to the west. Some of the descents through Albany may feel like Class IV material, but they aren’t – remain alert and cautious despite the food coma you’re likely contending with. 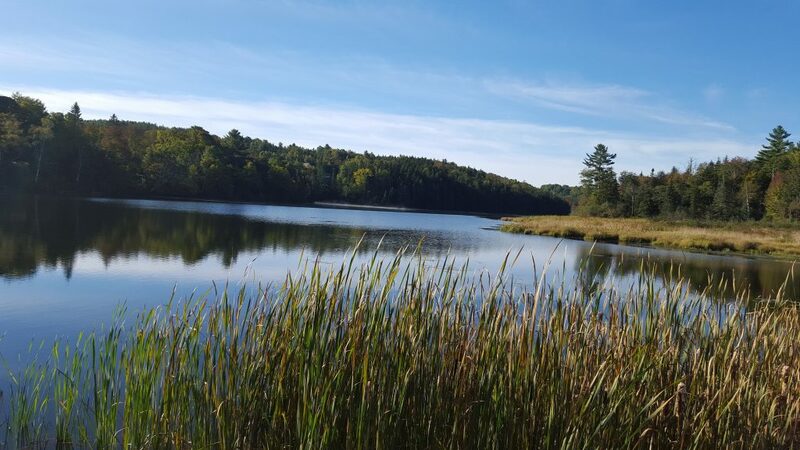 Once through Irasburg, the route winds through Coventry farm country just south of Newport, offering excellent dirt meanders alongside the oxbows of the Barton River. Just south of the International border, the route finds the next control in Newport at the Newport Natural Cafe and Market on Main St. – a favorite of Quebec cyclists daring enough to enter the USA. 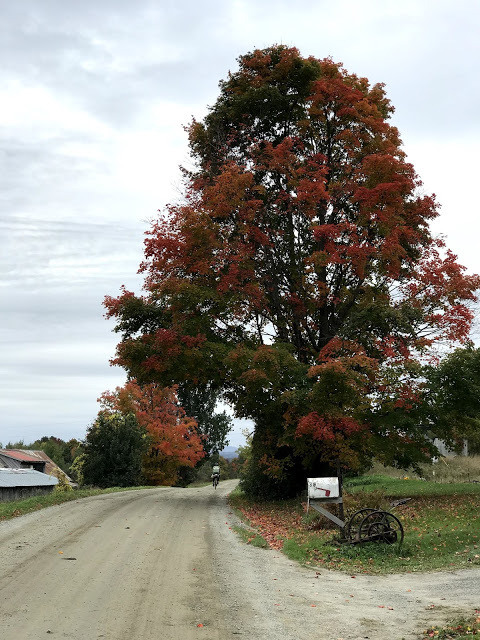 Riding west out of Newport, riders contour the shores of Lake Memphremagog until heading west across the backroads and pastures of Newport and North Troy. Views west towards the Green Mountains and Jay Peak foretell the final 1300ft climb up and over Hazen’s notch. 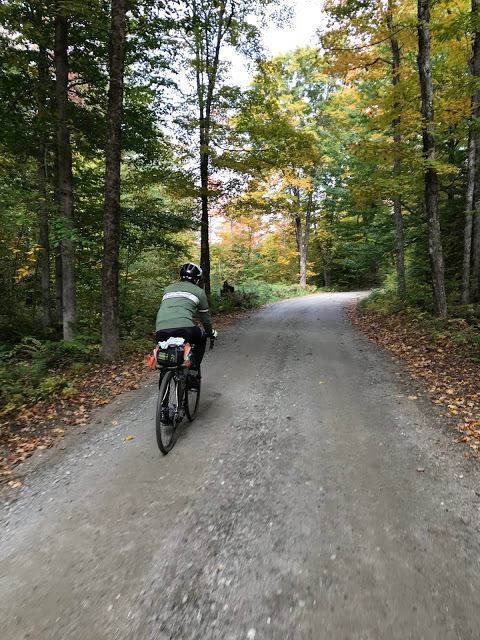 Riders pass through the towns of Troy and Westfield until heading back up over the Green Mountains on dirt tracks leading through Hazen’s Notch. The dirt descent into Montgomery Center is steep and narrow off the top, opening up as riders approach the ride finish where they began at Jay Cloud Cyclery/Blue Bike Cafe in Montgomery Center. Food and friends await. The 120k heads south out of Montgomery Center on Rt 118, following rolling pavement past Belvidere Pond to find dirt just outside of Eden. And that’s pretty much where the pavement ends. Leaving Eden, the route tracks east, beginning the long rolling dirt climb over Eden Mountain Rd. towards Craftsbury. 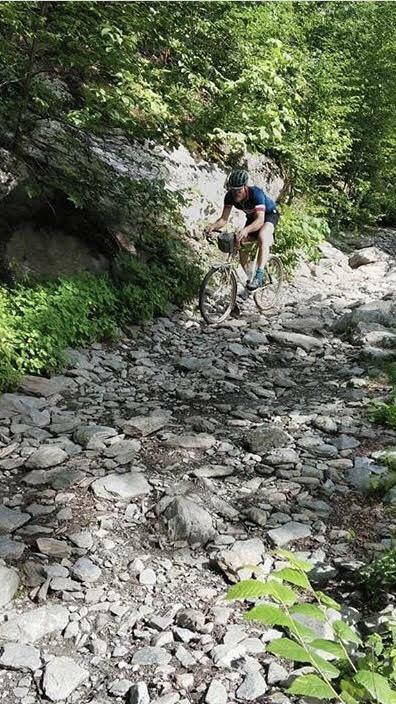 The dirt descent down into the Craftsbury Valley is usually well maintained, fun and swoopy. Head through quaint Craftsbury Common, then south into Craftsbury to the first control at the cyclist friendly Craftsbury General Store. Lunch here is fantastic – pizza, sandwiches, baked goods – the stuff of which rando dreams are made. 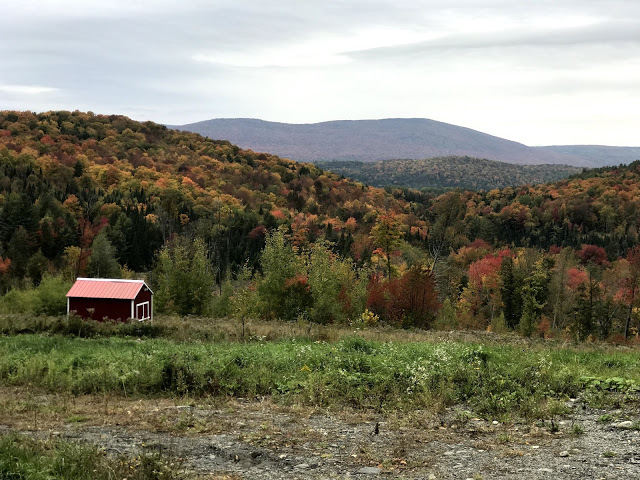 Out of Craftsbury, the route follows a ridge heading north into Irasburg, passing old farmlands, gnome homes, and forests with views of the Green Mountains to the west. Some of the descents through Albany may feel like Class IV material, but technically aren’t – remain alert and cautious. Once through Irasburg, the route follows pavement for a brief stretch to reach the Class IV region of Coventry farmland. Don’t miss the info control as you pass the Poutre farm on your right before entering a Class IV road over Clark Mountain. The route then briefly arches back south into a forested Class IV stretch before reemerging onto the dirt roads of Westfield. 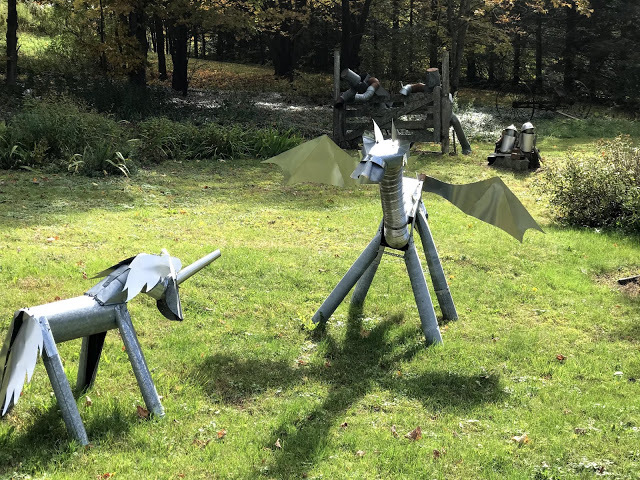 Take a respite at the next control of Berry Creek Farm or the Westfield General store just another few hundred feet down the road. Heading south out of Westfield, the route climbs back up into the Green Mountains on dirt tracks leading eventually through Hazen’s Notch. The dirt descent into Montgomery Center is steep and narrow off the top, opening up as riders approach the ride finish at Jay Cloud Cyclery/Blue Bike Cafe in Montgomery Center. Food and friends await. The excellent start/finish. Great crew at Jay Cloud. It’s a neat shop — combination classic soda shop coupled with a well stocked bike store. Super friendly people. Photo by Phil S.
Classic Vermont Class IV Roads on both distances. Nothing looks like this for too long but riders should come prepared. Rider featured is the excellent route designer Daniel J.
Tsun A. takes a break on one of the rougher sections of the 120km. Photo by Jan D.
October in Northern Vermont is perfect riding with a good sweater. Photo by Phil S.
This short section of bike path is about the only flat section. Nice 5 mile break. Photo by Phil S.
Metallic friends on the route. Photo by Phil S.
Gorgeous Fall Colors. Photo by Phil S.
Nice Dirt, Long Climb! Photo by Phil S.
Nice climb equals nice descent. 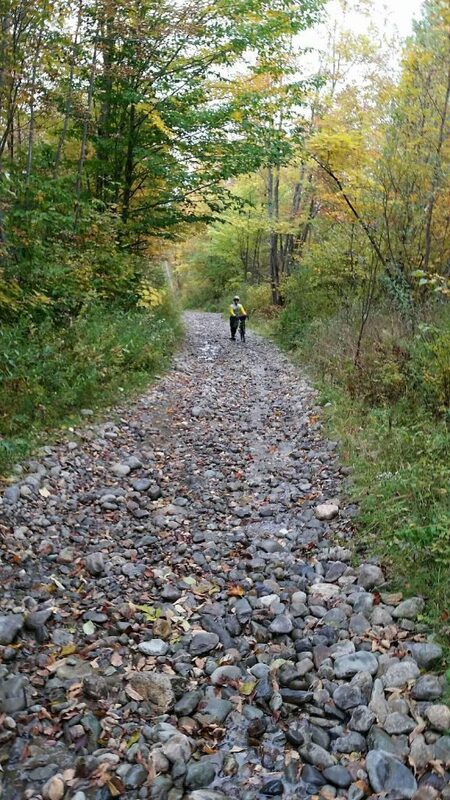 Photo by Phil S.
Class 4 roads in Vermont are public but unmaintained and often impassable without a larger vehicle or bike. These signs warn drivers not to follow their GPS or risk getting stuck. But for riders, it’s a very welcomed sign. Photo by Phil S.
Scenic vistas on both distances. Photo by Phil S.
It’s the only covered bridge on Covered Bridge Road! Photo by Phil S.
NER’s RBA in the distance. Photo by Phil S.